Never climbed ice before? Find out what the hype is all about. 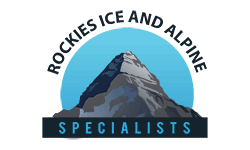 Let the professionals at Rockies Ice & Alpine Specialists instruct you in the exhilarating sport of ice climbing. Learn to work the ropes, and climb frozen waterfalls at an amazing ice canyon in the heart of the Rockies of Canada. 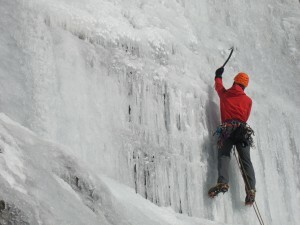 First you learn how to use ice climbing equipment. Practice on flat ground (like a skating rink!) and progress onto more steep terrain as you improve. We will provide ropes to anchor you from above. Our guides provide plenty of personalized coaching, so you get good fast. Soon you will be swinging around on vertical ice climbs! Most people are surprised to learn how easy it is to start, and how much fun. Located within a 30 minute drive from town and a 20 minute walk to the ice crag. Routes are up to 30m high, with a flat lounging area at the base. Full shank boots- we can supply these if you don’t have them. The season typically runs from November to April with February and March offering the best ice conditions.